On August 15, 2012 Wayne County Sheriff's deputies, along with Macedon, NY Police broke into 75 year old Phyllis Loquasto's Plank Road home in the town of Walworth, NY, forced her at gunpoint to lay on her bathroom floor, screamed at her to close her eyes and stay down, then executed her dog "Duke." Minutes earlier, Loquasto, who has had three strokes and a knee replacement, was on her computer when she heard loud smashing sounds, then saw what she described as several men dressed in black with masks on. As she was laying on her bathroom floor Loquasto could hear the men talking in loud voices. "The dog hadn't even barked, yet I heard one of them say, he's aggressive, shoot him! I'll never forget the sound of that gunshot and the blood flying everywhere. They did all this while forcing me to lay on the bathroom floor, screaming at me to stay down, and holding me at gunpoint. I couldn't get up if I wanted to. I'm 75 years old, had three strokes and knee replacement, and can hardly walk. There was nothing I could do to help my pet." Unfortunately, Duke died a slow death. "They shot him with a shotgun in such a manner that he ran around in pain and bled all over the house and suffered a slow, cruel death. There was no reason for this kind of treatment, they killed my dog for no reason. This was the sweetest and most gentle animal anyone could want, I would trust him with a baby." As you can see in the photo, Duke did indeed suffer, bleeding out throughout the house, leaving a trail of blood in the hallways, stairs, walls and bedrooms, including on the bed where he used to sleep in. 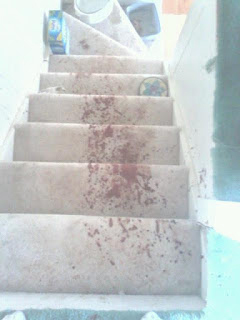 Trail of blood on Phyllis Loquasto's stairs after her beloved dog "Duke" was shot by WayneNET Task Force officers. Afterwards, Phyllis Loquasto was taken outside and placed inside a police car for over an hour in the heat. It was then when officers showed her a search warrant, and it was then that Loquasto realized who these masked men who had just broke into her home, held her at gunpoint, screamed at her and executed her dog were -- police officers. The 75 year old Loquasto was so afraid, she urinated on herself. As a filmmaker, writer and activist exposing police misconduct and corruption, hearing stories of police officers abusing and violating innocent citizens' rights is nothing new. In fact I receive an average of 20-25 calls weekly from people who either themselves, or a loved one, has been abused, harassed, or assaulted by law enforcement. But I must admit, to hear of a 75 year old lady having been terrorized in her own home by a bunch of rogue, thugs in uniforms and masks, in a "home invasion-like" style, before executing her dog, left me speechless. I Called Macedon, NY police and asked to speak to a public information officer. The woman who answered the phone asked me "What's that?" I explained to her it's usually a department official who is in charge of communicating with the press. She replied "We don't have that." I then proceeded to tell her about the incident with Duke, and before I could finish, she angrily cut me off and said "I'm sure if a grandmother would have been held down at gunpoint, I would have heard about that." She then abruptly transferred me to the Chief, with whom I left a message on his voicemail. About an hour later, I received a call from Macedon, NY Police Chief John P. Colella. After I thanked him for getting back to me, Chief Colella laughed and said "The media campaign continues." I asked Chief Colella what he meant by that comment, but he completely ignored my question. I then asked the Chief exactly what law enforcement agencies were present at the Plank Road residence. Chief Colella said that a search warrant was executed by the Wayne County Narcotics Enforcement Team (WayneNET) on the residence. He also said that he is the Task Force Commander. Chief Colella told me that his task force seized several marijuana plants from the location, which he said belonged to Phyllis Loquasto's grandson. He explained that the WayneNET team consists of the Wayne County, NY Sheriff's office, Macedon, NY Police, Clyde, NY Police, Lyons, NY Police, Newark, NY, Palmyra, NY Police, Sodus Point, NY Police, Wolcott, NY Police and the Wayne County, NY District Attorney's office. Chief Colella confirmed that the only person inside the location was 75 year old Phyllis Loquasto. Having sensed an obvious sense of sarcasm on the Chief's part, with his earlier comment, about the "media campaign continues", as well as what I would describe as the non-chalant, hesitant, and "careful" tone of his voice, not giving many details, I decided to get down to brass tax with the Chief. I asked him about police officers holding down a 75 year old grandmother at gunpoint on her bathroom floor, and it was clear that Chief Colella wasn't comfortable answering my question. But perhaps more interesting, he never denied officers doing this to Loquasto. Instead, Chief Colella made sure to choose his words very carefully, stating that all he would say is that she (the grandmother) was "held in place" by officers. Again, when I asked Chief Colella if in fact officers with his WayneNET task force held a 75 year old grandmother at gunpoint on her bathroom floor, Chief Colella replied "I don't care if she is 2 years old or 75 years old." I think Chief Colella must have realized that his statement would not look good, so he decided to do some 'damage control' by quickly adding "We needed to secure the location and since there was a dangerous animal, we were holding her down for her own safety." "Holding her down for her own safety?" After a few more minutes of talking with Chief Colella, it became more and more clear that as is common with law enforcement officials, especially in cases of misconduct and abuse, the "cover-up" had already begun, and Chief Colella, along with his WayneNET task force, clearly have their story which they have every intention of sticking to. Contact Macedon, NY Police Chief John P. Colella and let him know how you feel.